Each Year the Exchange Club of Oklahoma City gives 5 Youth of the Month Awards and One $2000 Youth of the Year Scholarship to local Students. The Youth of the Month/Year Award recognizes hard-working high school students who attain high levels of scholastic achievement, community involvement and leadership. This proven program not only rewards outstanding young people, but also provides an incentive for other youngsters to strive for equally high levels of achievement. Selection of the Youth of the Year is simply made from the club's Youth of the Month recipients for that school year. The club's Youth of the Year advances to district competition, and ultimately, has an opportunity to vie for the prestigious National Youth of the Year Award and a chance to win a $10,000 scholarship. Please click here for 2018-19 dates and application process. Each Year the Exchange Club of Oklahoma City Awards a $2000 ACE Scholarship to a Local Oklahoma City metro High School Student. A.C.E. stands for Accepting the Challenge of Excellence. This program recognizes high school students who have made a dramatic change in their attitude and performance during their high school years. These changes have enabled the students to overcome adversities and prepare for graduation. Clubs may also submit their top A.C.E. Award winner to the district competition. Winners at the district level then have an opportunity to compete for the National A.C.E. Award and a chance to win a $10,000 scholarship. Please click here for 2018-2019 dates and application process. In 1988, Parent Promise was founded by members of the Exchange Club service organization and opened its doors as The Exchange Club Center for the Prevention of Child Abuse of Oklahoma, Inc. In 2001, The Exchange Club Center merged with Prevent Child Abuse Oklahoma, expanding its services to include public education, community awareness and parenting resources for all parents in our community. Honoring a fellow citizen with the Book of Golden Deeds Award is a heartwarming and inspiring act not only for the honoree, but for any Exchange Club. 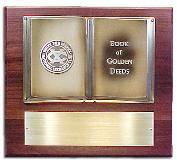 The Book of Golden Deeds Award exemplifies The National Exchange Club’s beliefs. The Oklahoma City Exchange Club hunts for and takes nominations annually of Volunteers that non-profits would like to nominate to receive this award. The non-profit organization making the nomination of a Volunteer is awarded $500 by the The Exchange Club of Oklahoma City. 2016-17 Book of Golden Deeds Award--Beginning January 1, 2017 we are taking written letters of recommendation for local Oklahoma City volunteers. Please email okcexchange@gmail.com with those letters or mail them to The Exchange Club of Oklahoma City, P.O. Box 12324, Oklahoma City, OK 73157-2324. We will be accepting letters of recommendation through the end of February. Veterans Matter's mission is simple, to house as many unhoused veterans as we can, as fast as we can, while preventing more from becoming unhoused. Veterans Matter has a 100% success rate housing veterans in a LONG-TERM VA supported housing program that has a 91% success rate keeping them housed. 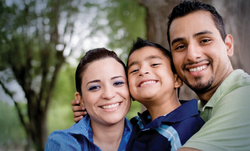 As of 11/10/15, they have housed our 846th* veteran/veteran family in 11 states/regions. During the month of April, National Child Abuse Prevention Month, the State Capitol lawn is covered with row after row of American flags to represent the (approximately 1,500*) children that died as a result of abuse and neglect during the previous year. A special section of state flags (approximately 40*) represent Oklahoma children that died during the same year. Drive past the south lawn of the OK State Capitol. It's quite impressive to see and a stark reminder of how many children we loose each year to child abuse. Let's put a stop to it! 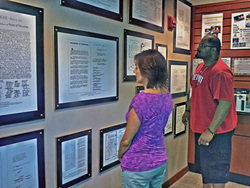 The Freedom Shrine is an impressive, permanently mounted collection of 30 of the most important and historic American documents, including the Declaration of Independence, the Constitution of the United States, Martin Luther King's "I Have a Dream" Speech and others such as the Gettysburg Address. They show our nation's youth the strength and courage of their forefathers by allowing them to read, with their own eyes, the immortal words of inspired Americans who so decisively changed the course of history. The Exchange Club of Oklahoma City Donates one Freedom Shrine Annually. 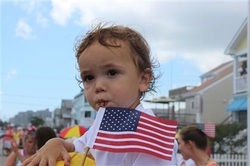 Just as its tongue-twisting title suggests, this popular projects involves the distribution of small American flags to youngsters at parades, fairs, picnics, school events or other community happenings that generate large crowds. The flags are absolutely free to the children and can make a great souvenir of the occasion. The Exchange Club of Oklahoma City passes out flags every year for free at the annual Bethany 4th of July Parade.